Self-Monitoring Blood Glucose Devices Market size was valued at USD 14.3 billion in 2017 and is expected to witness 5.1% CAGR from 2018 to 2024. Increasing prevalence of diabetes in developed as well as developing economies is a major factor driving the market during the forecast period. Diabetes morbidity and mortality is generally high in low and middle-income countries. As per the International Diabetes Federation’s Diabetes Atlas, in Western Pacific region, prevalence of diabetes in people aged between 20-79 years was 158.8 million in 2017 and is projected to reach 183.3 billion by 2045. 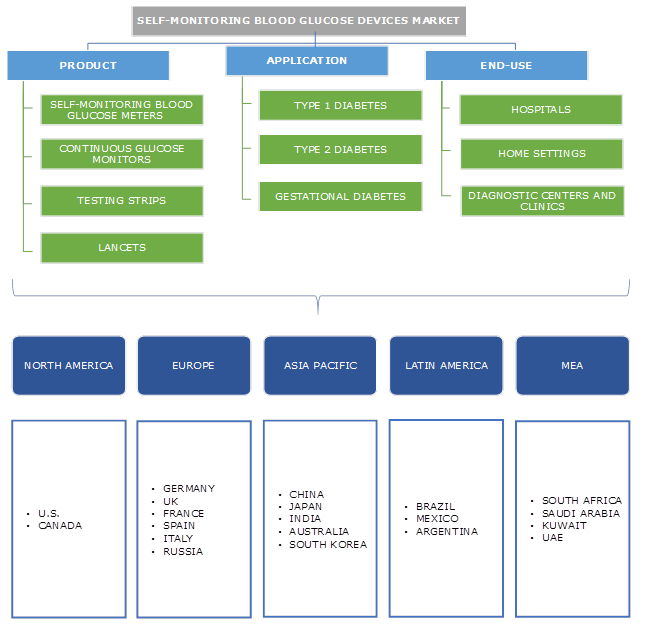 Furthermore, various government initiatives to increase awareness among people regarding diabetes care and management, increasing investments in R&D for developing innovative technologies along with growing healthcare expenditure will surge the self-monitoring blood glucose devices market size during the forecast timeframe. 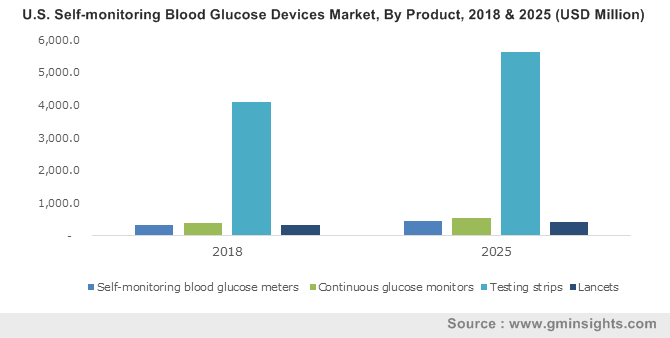 However, stringent regulations pertaining to development of advanced blood glucose monitoring devices will impede growth of the market during the forecast period. High cost of glucose monitors and associated treatment accessories is unaffordable in developing countries. Such factors may hamper the self-monitoring blood glucose devices business growth over the analysis period. Testing strips segment accounted for the largest market share of around 80% in 2017 and is projected to manifest similar trend during the forecast period due to rising prevalence of diabetes worldwide. Developments in testing strips such as Solo meter that contains 4-leads on the testing strips helps to provide rapid and more accurate test results. Aforementioned factors will spur testing strips market size throughout the forecast period. Continuous glucose monitors (CGM) segment is expected to witness highest CAGR of 5.7% during the analysis timeframe. These devices are generally used in patients that require frequent blood glucose monitoring over a period. CGM systems help to predict future events of hypo or hyperglycemia up to 60 minutes and provides information regarding clinically relevant glucose patterns. Such benefits of continuous glucose monitors in elderly or ICU patients will accelerate segmental growth over the forthcoming years. Hospitals segment dominated the self-monitoring blood glucose devices market with a revenue of USD 6.9 billion in 2017 and is anticipated to show significant growth over the analysis period. Increasing need for efficient, accurate and continuous blood glucose monitoring in ICUs to monitor the risk of hypo or hyperglycemia in patients will boost the demand for advanced glucose monitors in hospitals. Availability of advanced healthcare facilities as well as presence of skilled professionals will drive the segmental growth over the forecast timeframe. Home settings segment is estimated to grow with highest CAGR of 5.7% over the forecast period due to large patient population suffering from diabetes. Advancement in diabetes care products to offer portable, efficient and easy-to-use devices at home will drive the segmental growth over the coming years. Growing inclination of people towards technologically advanced products will further accelerate the segmental growth. Additionally, self-monitoring of blood glucose levels at home helps people in decision making and analysing the effectiveness of current diabetes management. Such factors will boost the segmental growth during the analysis period. North America market dominated the market with 39.1% revenue share in 2017 and is estimated to show robust growth over the analysis period. Growing prevalence of diabetes in the region is the key driver that will boost the self-monitoring blood glucose devices market growth over the coming years. Prevalence of obesity is high due to lifestyle changes, unhealthy dietary habits and other environmental factors escalating diabetic population. Moreover, awareness among people regarding diabetes management coupled with high demand for advanced diabetes care products will flourish the regional self-monitoring blood glucose devices market in the foreseeable future. Asia Pacific market is expected to grow at a robust CAGR of 6.1% over the forecast period. Increasing prevalence of diabetes coupled with rising geriatric population base prone to chronic diseases will serve to be positive impact rendering factor for industry expansion. According to World Health Organization, in India, around 7.9% of the total female population and over 7.5% of the total male population had diabetes in 2016. Furthermore, developments in healthcare facilities, increasing disposable income and growing adoption of advanced products will augment the regional self-monitoring devices industry growth over the analysis timeframe. Some of the notable players operating in the global market are Abbott Laboratories, All Medicus, Arkray, B. Braun Melsungen AG, Bayer Healthcare, Bionime Corporation, Dexcom, F. Hoffmann-La Roche, Johnson & Johnson, LifeScan, Medtronic, Nipro Diagnostics, Nova Biomedical, Sinocare and Trividia Health. Major strategies adopted by the industry players include strategic acquisitions, collaborations, mergers and new product launch to enhance company’s product portfolio and expand business across the globe. For instance, in January 2018, Arkray Inc. entered into a license agreement with Mellitus Health to integrate its products into Arkray's portfolio of diabetes care products. Increasing prevalence of diabetes across the globe will drive the global market growth over the forecast period. Growing geriatric population base and rising awareness among people regarding diabetes care and management will serve to be high impact rendering factors for industry growth. The self-monitoring blood glucose devices market is expected to witness lucrative growth over the coming years owing to growing demand for technologically advanced blood glucose monitors. The industry players are rigorously investing in R&D activities to launch innovative products and diversify company’s product portfolio.